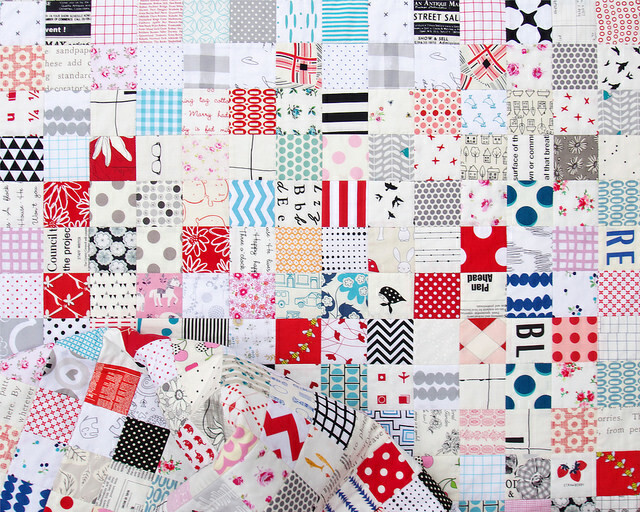 This quilt is all about the fabrics and the colors and as usual I have lots of photos to show of the finished quilt. 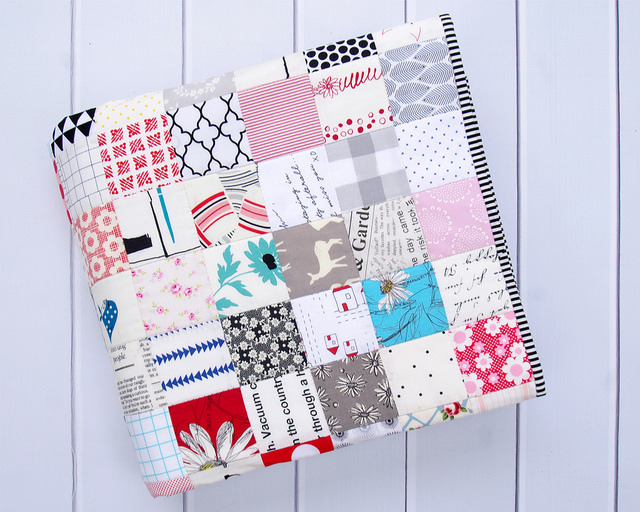 There is a lot to take in for I have used a variety of fabrics all from stash; from stash basics to novelty fabrics (animals, flowers, birds, bees, faces, accessories and more) as well as feature fabrics that vary from small to medium scale designs. The color palette is a classic color combination: predominantly red, black, and white. I have added sprinkling of grey and blue for interest. You just can't go wrong with a classic color palette. 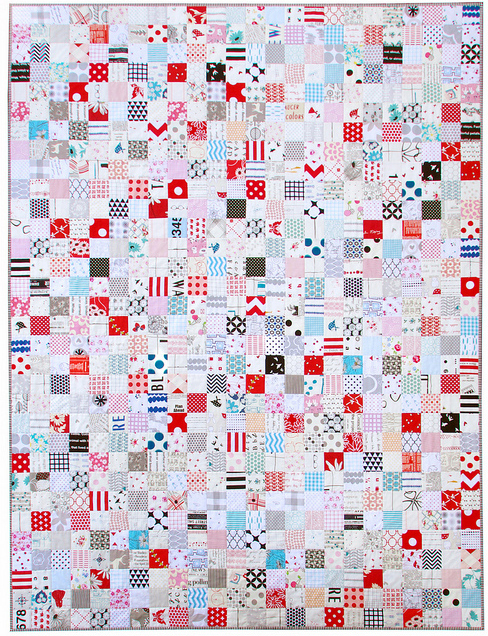 Despite the use of so many different fabrics it is the use of a limited color palette that gives this quilt a harmony that allows the eye to wander freely. 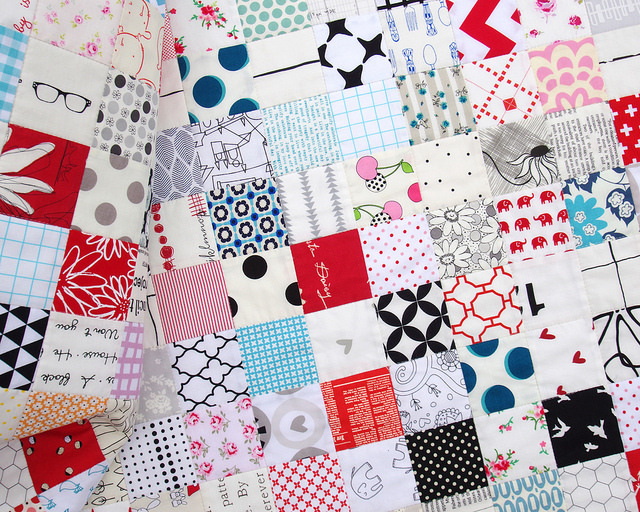 That's not to say that I don't enjoy a super scrappy quilt! 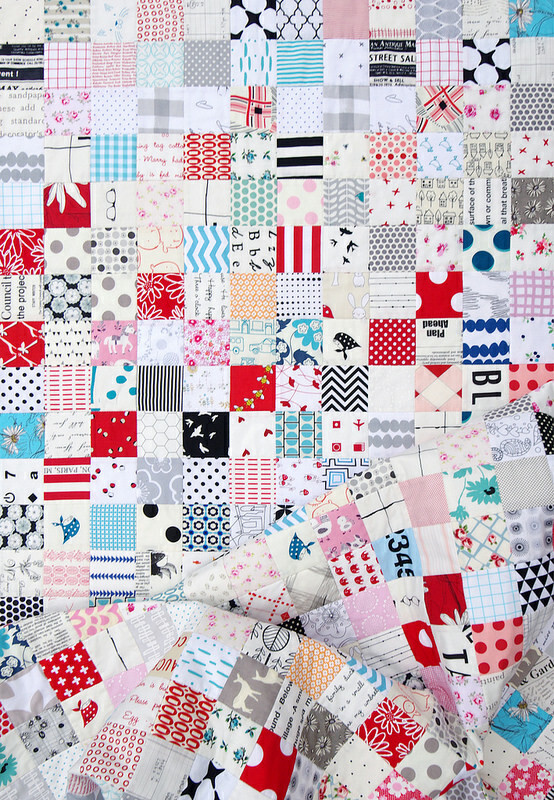 A Postage Stamp Quilt randomly drawn from stash fabrics is on my quilt list for this year. 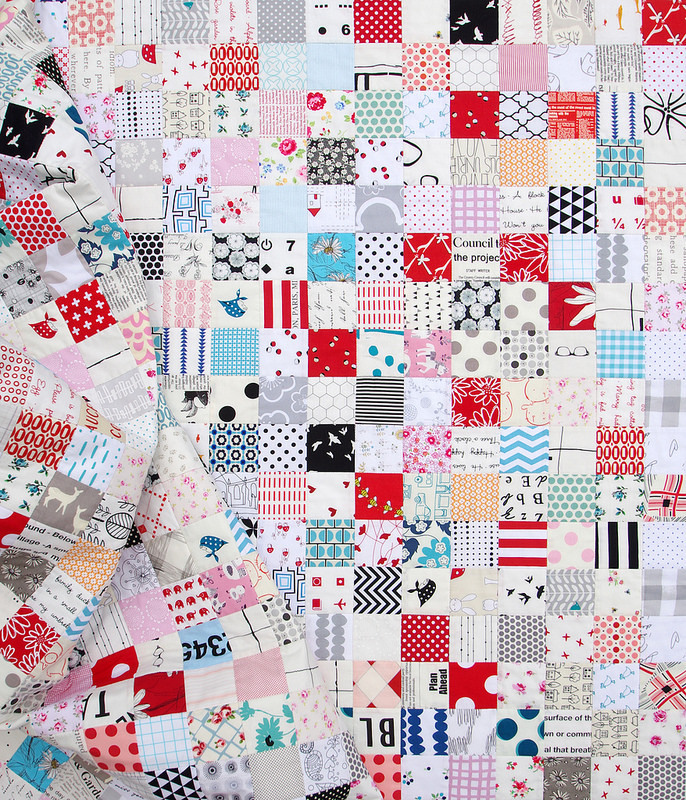 A selection of almost 200 different quilting cottons make up this quilt. 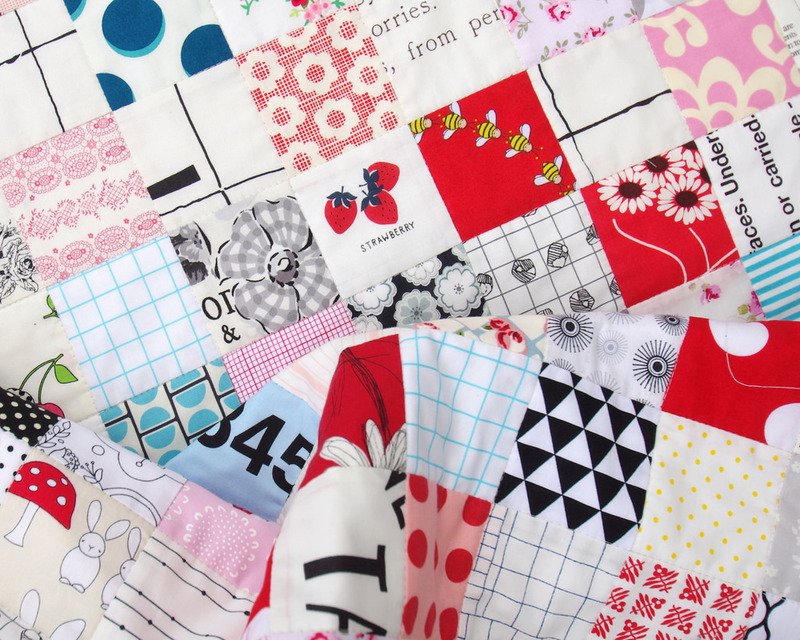 I made 48 16-patch blocks ~ a total of 768 patches of fabric. All cotton fabrics, batting and thread have been used. The finished quilt measures 60 inches x 80 inches. 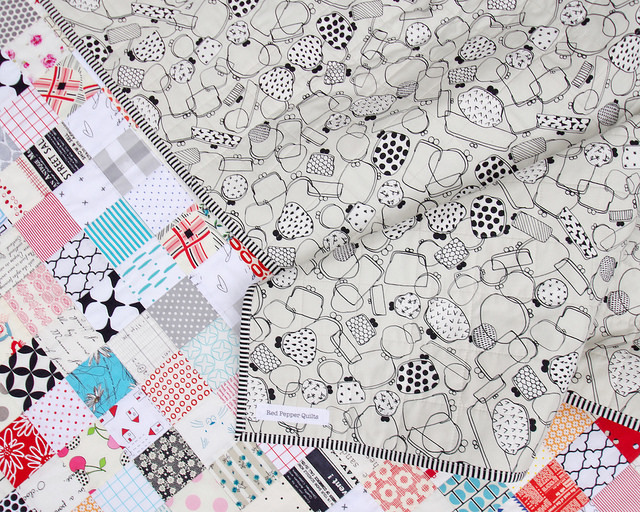 I have quilted this quilt by ditch stitching all seam lines (creating an all over 2.5 inch grid of intersecting lines); simple and functional quilting, allowing the fabrics to feature, and adding just the right amount of texture to soften the quilt. 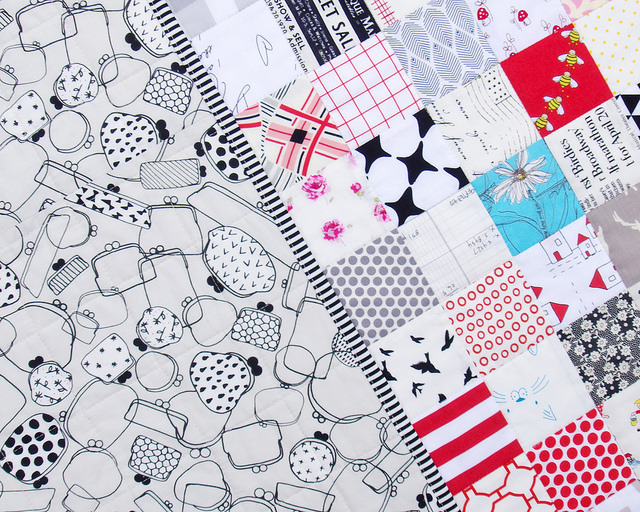 For the back of the quilt I have used a single Cotton + Steel fabric from last year's Black and White Collection. 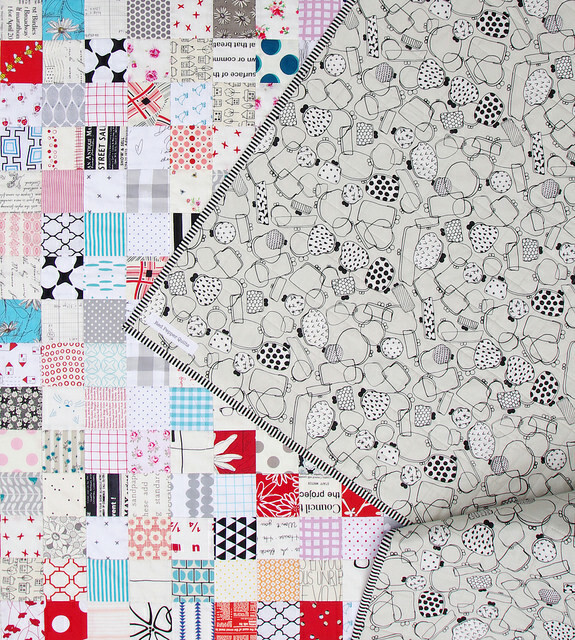 This particular fabric is called Gamaguchi and it features a collection of purses in all shapes and sizes. 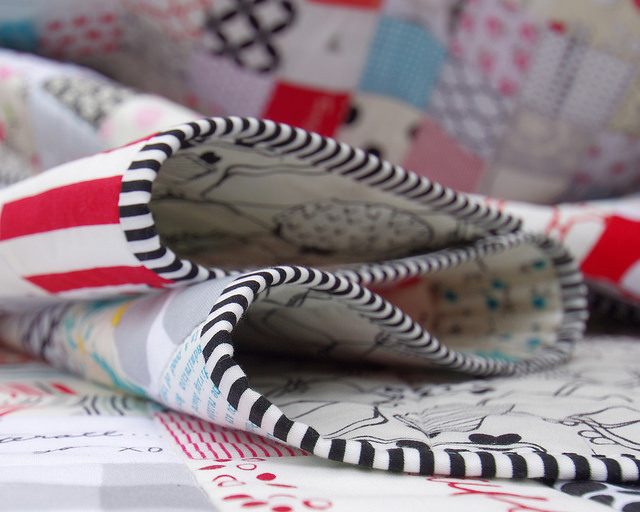 For the binding I have used my signature black/white stripe fabric. Measuring 60 inches x 80 inches this is one of my bigger quilts. I tend to shy away from big quilts for basting and quilting a large quilt on a domestic sewing machine is a physically demanding and labor intensive (and it is so much harder to get a good photo of the whole quilt!). However, every time I do make a big quilt I am always pleasantly surprised by how well it turns out; it is possible, I can do this, despite the wrangling (even in this Summer heat) and serves as a reminder to never say never. So lovely - simply amazing! 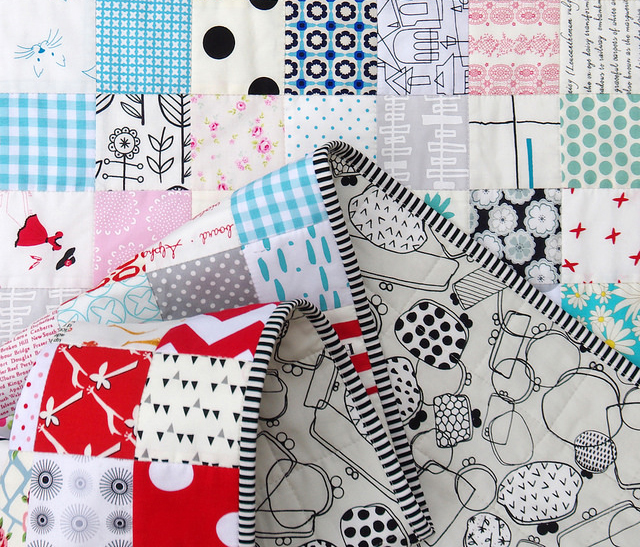 Your work is inspirational - I just love your colour combinations and choices of fabric. You make it look deceptively easy. Another beauty! That backing looks great with top! No surprise this sold in a flash. I love it! 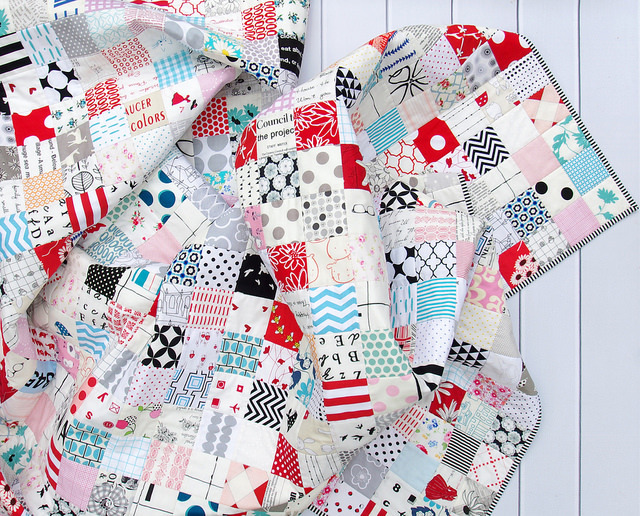 You have the most amazing "scraps" and such an eye to put them together. I am always afraid to use red. 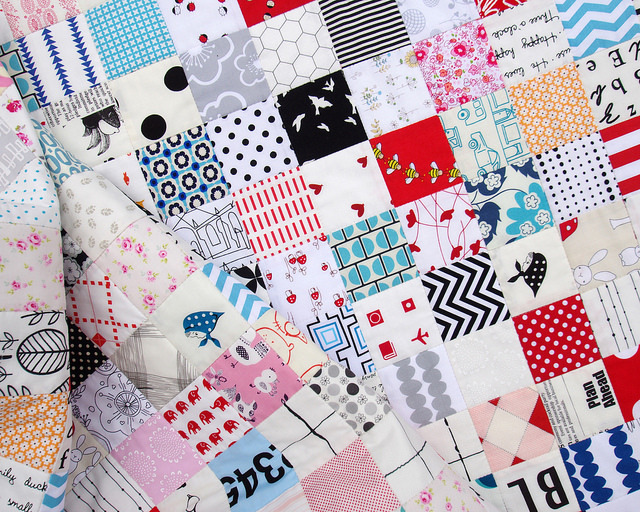 Your quilt is absolutely beautiful, thank you for sharing it with us.